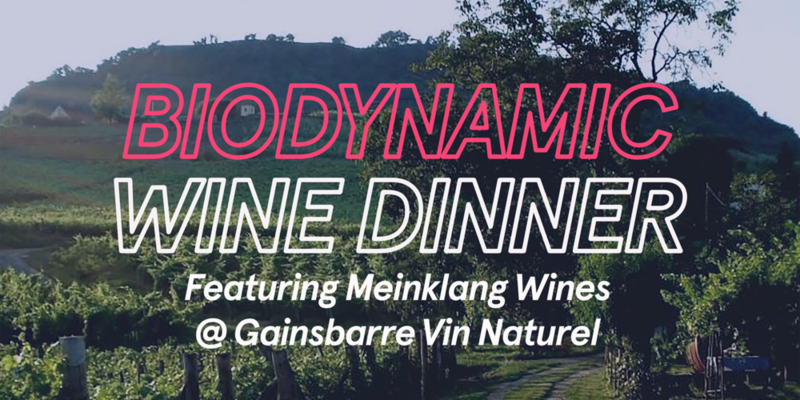 Join us for a four-course dinner with wine pairings from Meinklang in Austria, producer of the most beautiful certified biodynamic, organic, sustainable and vegan wines. Wine flight includes Pinot Gris and Zweigelt from the wild, untamed Graupert Vineyard. Floral, smoky, thyme, nutmeg and lemongrass! Wild and green, silky and smooth with a honeyed mouthfeel. Smooth, tart acidity and bright minerality. 100% Hárslevelü with two days of skin contact and no so2. Citrus blossom, mineral, pink grapefruit, and bitter lemon. Spicy and floral, aromatic, luxurious and complex. Gorgeous rosy color. Ten days of skin contact and no so2. Juicy raspberry, cherry, plum and violet. Blackberry jam, roses, musk, frankincense and dark chocolate. Light, velvety and dry with lively acidity. Figs, juniper, ancho chile, and musk; deep, strong, woodsy, and juicy. Balanced, smooth and dry. Incredible mouthfeel. Each course thoughtfully prepared by Chef Todd Martin. Natural Wine is wine produced with minimal intervention. Nothing is added, and nothing is taken away. Organic, biodynamic, or sustainably produced; un-fined, unfiltered, native yeasts only, no additives and little to no sulfites. Natural wine is a true expression of the grape varietal and of the terroir, the surrounding soil and flora. Biodynamics is an ecological and ethical approach to farming which works in rhythm with nature. A biodynamic vineyard is a self-sustaining ecosystem; a living organism that brings plants and animals together in a fertile and biologically diverse environment, resulting in products with higher nutrition and excellent flavor. Biodynamic wines are some of the most intense and expressive wines available. Join us to taste the most incredible gifts of nature. One seating, limited seats available. Starts at 7pm.